“I’ve found that nothing could ever prepare you enough for motherhood and the crazy roller-coaster ride that it brings. But it’s also the most beautiful love relationship ever to be experienced and not a second goes by that I don’t realize how precious this all is. It’s crazy to think that when we were younger, as girls we always played house and talked about the number of kids we wanted and their names and houses with that perfect image of dancing in the kitchen with your family and singing them to sleep. While those dreamy moments truly may be few and far between in the midst of laundry or tantrums or tired eyes, they’re the very moments that make all the other crazy moments seem so so small. It’s usually at the very end of each day when we finally stop to rest for a few quick hours before our feet hit the ground again that we get to soak up the good parts of the day – the pieces we want to remember and hold on tightly to. But oh, I pray we can slow down. I pray we make time to stop long enough to soak up these details and to love them hard. This generation we’re all mothering in can be intimidating with an ideal image we’re expected to live up to. But when we all get real with one another, it’s humbling to learn that we’re ALL in this same boat together – that the minute we start to doubt ourselves or our image or our abilities, may we stop and remember that comparison is the thief of joy. 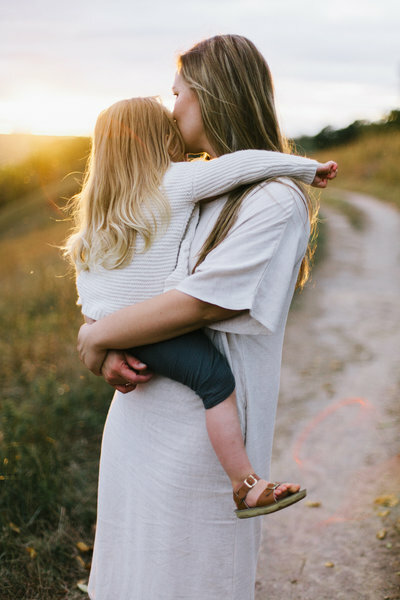 That certain mom who we feel has it all together goes through the exact same struggles, victories and fear that we do. Our lives are forever rocked when we bring our babies into this world and we find ourselves pressed for time, always feeling behind or that there’s not enough hours in the day. And I wonder if we’re too hesitant to give ourselves grace for the fear of feeling inadequate or simply because we want to conquer the world in a day. Either way, when I see my daughter looking back at me, soaking up every facial express and every word, none of that “stuff” seems to matter and I find myself promising to speak truth and positivity and encouragement into her bright big world. When life and unmatched expectations feel all-consuming, I always seem to be reminded that these kids want nothing more than our love and affection and whole-hearted attention. They don’t see the laundry list of things we have yet to conquer or the emails still sitting in our inbox or the dreams we haven’t reached but they see beauty and strength and THAT is what I pray they remember.